The Triple Outboard Engine Craze – Is it Crazy? Your Boat is Sinking? Remember These Three Things! 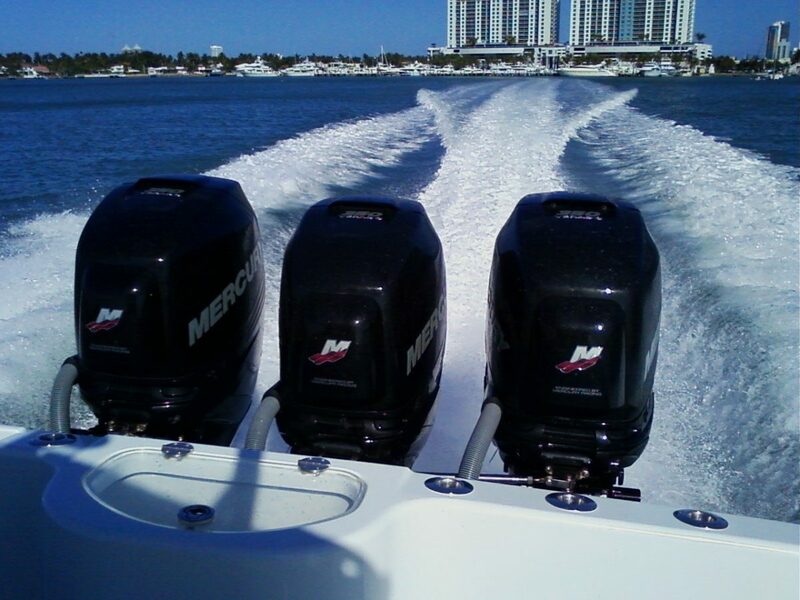 Yes, three of a kind is a charm, when it comes to outboard engines. The knee-jerk reaction to this question is, invariably, yes – putting triple outboards on the transom of your boat surely seems nuts. But almost everyone follows up this admission by laughing and then pointing out that they love running or riding on one of these super-juiced fishing machines. More power is more better. Never mind the awful efficiency, obscene fuel consumption, and… hey, wait a second! Triple engines are actually MORE fuel efficient than twin screws of equal horsepower. Huh? Could this strange assertion possibly be true? As counter-intuitive as this may seem, triples are in fact more efficient than twins. This sounds especially bizarre since twins are less efficient than a single engine of equal horsepower. The reason is drag; that second outdrive being pulled through the water creates a lot of it. So, how can trips be better than twins? The reason is because all three motors work a lot less in order to push the boat. So much less, that it more than makes up for the extra drag. If you run a twin engine boat at 4500 RPM, for example, a triple-screw rig may be able to attain the exact same speed at 3000 RPM. And, it can do so while burning less fuel overall. Dozens of boat tests have proven this to be the case. In fact, I averaged together the efficiency numbers for the boats I’ve tested in both twin and triple engine configurations, and found that the twins averaged 1.28 MPG, while the triples averaged 1.30 MPG. No, the difference isn’t very big, but it’s true: rigging with triples isn’t just fun – it’s also more efficient.